This is only the second event which is recorded in all four gospel accounts. The chief priests wanted to arrest Jesus after he had raised Lazarus from the dead (John 11:53, 57). Yet Jesus rode into Jerusalem on Sunday morning at the head of a massive crowd and they could do nothing. Despite the price on his head, Jesus’ popularity was at an all-time high. All of Judea was abuzz with the news about Lazarus (John 12:9-11). The pilgrims from Galilee had entered Jerusalem with the news that Jesus himself had traveled with them, teaching and working miracles. Messianic hope was always very high among the Jews during Passover season, but this news about Jesus excited the entire city. At last, their King was coming! The people took palm branches and came out of the city to welcome him as king . On the way, they chanted Psalm 118, “Blessed is he who comes in the name of the Lord!” (Psalm 118:25-26). The chant of “Hosanna”, meaning literally “save now”, had become the phrase to welcome the king, “Come and save us!”. The population of Jerusalem would swell to about two million people during the Passover . Jesus entered Jerusalem on March 29, 33 A.D. .
Only Matthew’s and John’s accounts show that the colt was a young donkey. Only Matthew shows that the mother was also taken by the disciples. Only Mark’s account shows that the disciples promised to return the donkey and the colt immediately afterward. Jesus had left Bethany that morning, and needed to cross through the tiny village of Bethphage on the way to Jerusalem. The donkey and her colt were most likely located in Bethphage as the “village in front of you”. The name Bethphage means, “House of Figs”. One possibility is that Jesus had prearranged this with the owner. Jesus had visited this area very frequently and had stayed in Bethany for the past two nights. There was ample time for Jesus to make arrangements with the owner to use his animals. The other possibility is that Jesus knew about the animals from his frequent visits to the area. The owner did not know Jesus but he was carried away with the excitement of the day. He would have been glad to lend his animals to the coming Messiah! The disciples did as Jesus instructed and untied the colt (and its mother). When the owners asked them what they were doing, they replied “The Lord has need of it”, and the owners let them go. Bethphage was on the outskirts of Jerusalem, where the disciples met Jesus with the colt and the excitedly gathering crowd. The disciples spread their cloaks on the colt and he thus roade the remaining distance into Jerusalem. The crowd spread their cloaks on the road and laid down the palm branches in order for Jesus to ride on them. It was a custom to spread the coats in the presence of a king (See 2 Kings 9:13, when the soldiers spread their coats for Jehu). Jesus had previously avoided the title of Messiah, but now he encouraged it during the final week. The manner of Jesus’ entry into Jerusalem fulfilled the prophecy in Zechariah 9:9 (see also Isaiah 62:11). The king would come humbly — he would have no military presence. The king would come in peace. The donkey was not a lowly animal but the royal symbol of peace in that culture. The king would only ride a horse in times of war. His disciples did not understand these things at first, but when Jesus was glorified, then they remembered that these things had been written about him and had been done to him. The crowd that had been with him when he called Lazarus out of the tomb and raised him from the dead continued to bear witness. The reason why the crowd went to meet him was that they heard he had done this sign. The disciples did not understand the significance of this event until much later. It was not until Jesus returned to glory that they understood the prophecies which he had fulfilled. John 12:12 shows the distant pilgrims who had come for the Passover. Most of them were probably from Galilee. John 12:17 shows the crowd that had been in Bethany when Lazarus was raised from the dead. John 12:18 shows large crowd from Jerusalem had come out out of the city to see the one who had raised Lazarus. The Pharisees, in their frustration, come to Jesus to ask him to quiet the crowd. But this was the day that The Lord had made for the Messiah’s return (Psalm 118:24). If the people would not proclaim him, even the inanimate objects would be called on to testify for him. On the surface, it looked like the Jewish nation was ready to receive Jesus as their Messiah. Even the Pharisees believed that they have lost. All is wonderful. But only Jesus was able to see through the unstable crowd. The people had been longing for the Messiah to come and save them from Rome. The Passover season was the time to celebrate when God had used Moses to save them from an evil tyrant. Now, they saw a new evil tyrant in Rome as they longed for the Messiah to come and free them. But the people had forgotten the primary purpose of the Messiah. Before he would set up his promised kingdom, he must first save them from sin, and reunite them with God (Genesis 3:15). See the link here for more details. The people were looking for a military leader, not one who would save them from sin. Therefore, they missed the Messiah. They missed the “time of their visitation”. These same people who were praising him on Sunday would be shouting for his death on Friday. As Jesus ascended the Mount of Olives, the entire City of Jerusalem came into view. Luke says, “as he saw the city, he wept over it”. Not with the quiet tears but with the loud and deep sobbing (klaiō, κλαίω) of grief. As the crowd of worshipers chanted his praise en route to the beautiful city, He alone could see their rejection. They had rejected their Messiah. Now the city and the people that he loved so dearly would be totally destroyed. As the procession entered Jerusalem, the people of the city were asking who this was. The answer was repeated, “This is the prophet Jesus, from Nazareth of Galilee”. They did well to tell of His name and his home town. They also knew that he was from God (“the prophet”), but they stopped short of calling him their king. The procession from Bethany must have taken the entire day. By the time Jesus reached the temple, he looked around at the temple and returned to Bethany. Daniel 9:24-27 provides one of the most specific prophecies about the coming Messiah. 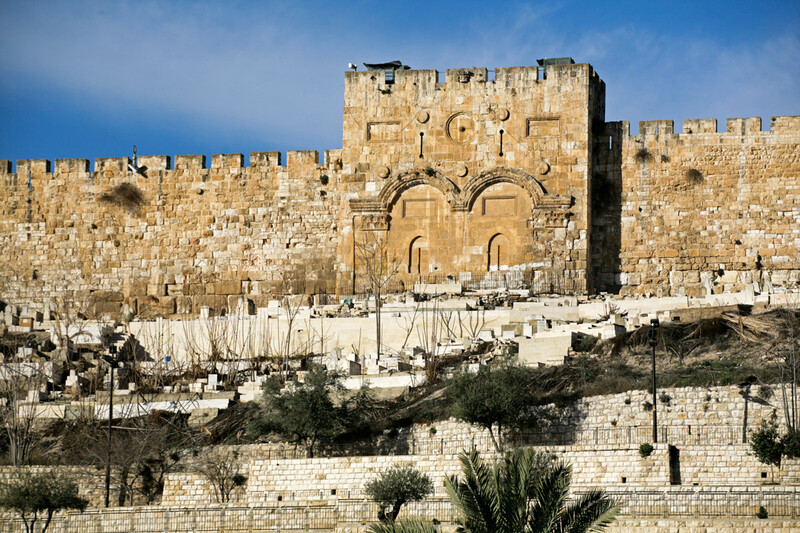 Daniel predicts that there will be 69 weeks from “the going out of the word to restore and build Jerusalem” to “the coming of the anointed one” (Daniel 9:25). The “week” is a set of 7 years. The decree to rebuild Jerusalem was given on March 4, 444 B.C. (Nisan 1 of the 20th year of King Artaxerxes) according to Nehemiah 2:1-8. Therefore, 69 weeks (or 173,880 days ) later would be March 29, 33 A.D. Source, Doug Bookman, based on Chronological Aspects of the Life of Christ, by Harold Hoehner . “Half of a week” in Daniel 9:27. “Time, times, and half of a time” (i.e. 3 1/2 years) in Daniel 7:25, Daniel 12:7, Revelation 12:14. 1260 days in Revelation 12:6, Revelation 11:3. 42 months in Revelation 11:2, Revelation 13:5. Therefore, a month would be 30 days and a year would be 360 days.